The stormy weather of the last few weeks has brought a series of dramatic skies as clouds streamed across the sky driven on strong winds. Every so often the sun has split the clouds sending shafts of light onto the land below. Patches of blue sky have appeared briefly between the torn apart clouds. The land has been dark and wet, with only touches of snow and frost below 700 metres. Higher up there has been an almost bewildering freeze-thaw pattern with the hills pure white one day then streaked with brown the next. 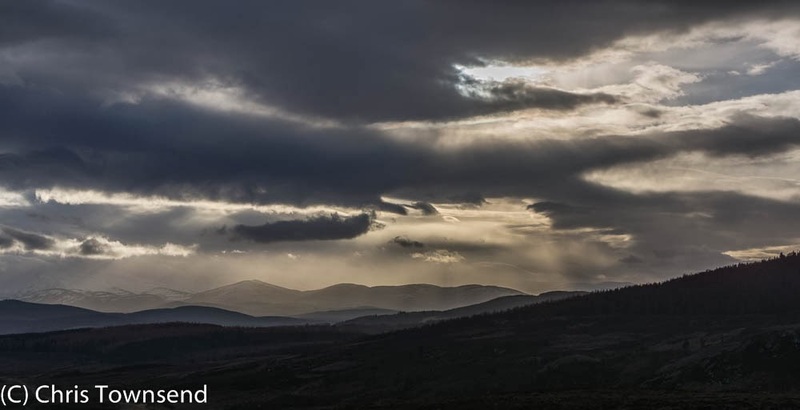 Wandering up onto the moors of the north-east corner of the Cairngorms National Park we looked out across broad Strathspey to the distant snowy high hills. Today there looked to be fresh snow on the summits as they came and went in the racing clouds. A grouse broke cover and streaked low over the heather, calling loudly. Five deer appeared on the skyline then dropped out of sight. Otherwise the land was silent and empty, the only sounds the whispering of the wind in the grasses and the trickling of tiny streams. With another intense Atlantic low pressure system arriving soon there is no sign to an end of this wild weather. As always there are rewards in the storms, with the ever-changing, multi-layered clouds being the highlights so far. Nature is never boring.